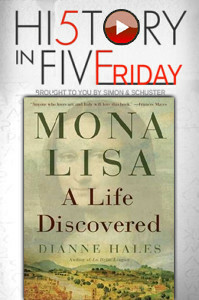 December 11, 2015 – It’s History in Five Friday, presented by Simon & Schuster — kicking off your modern weekend, with people from the past. Today, author Dianne Hales reveals the woman immortalized by the great master, Leonardo Da Vinci. Everybody remembers Mona Lisa’s smile, and has seen her face, but no one knew her full story — until now. You can find Dianne Hales on Twitter @DMHales, at Facebook.com/MonaLisaALifeDiscovered, or by visiting MonaLisaBook.com.